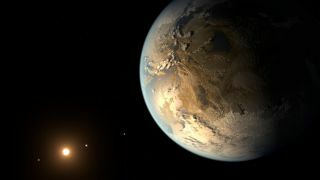 A checklist for the requirements of life as scientists define it could help ground speculation about the possibilities of alien life on distant worlds, new research suggests. Astronomers have confirmed the existence of more than 1,700 planets beyond the solar system, and may soon prove the existence of thousands more of such exoplanets. To understand whether life might exist on alien worlds, McKay suggested scientists should evaluate both the requirements for life on Earth and the limits of life on Earth. Although scientific understanding of the requirements for life has not changed in many years, researchers' thoughts on the limits of life are have altered significantly in the past few decades, McKay said. There are four general categories of the requirements for life on Earth: energy, carbon, liquid water and miscellaneous factors, McKay said. The energy for life on Earth all comes from the shuffling of electrons from molecule to molecule by chemical reactions, which is driven by light-absorbing proteins in the case of photosynthesis. Carbon is the backbone of life on Earth because it can support an extraordinary variety of molecules for use in biology. Liquid water serves as the solvent in which the chemical reactions of life on Earth take place. Other factors required by life on Earth include elements such as nitrogen, which is used to make proteins and DNA, among many other molecules. McKay noted that life could dominate exoplanets, and hence be detectable over interstellar distances. But that would only happen if that life is powered by light, he said. Still, life may not need much light in all cases; algae on Earth that live in the deep sea or under ice can survive on sunlight at levels less than one-100,000th of what Earth receives, a value that exceeds the amount of light that Pluto receives by about 100-fold. Light can also provide energy for life in ways beyond photosynthesis. For instance, on worlds like Saturn's moon Titan, sunlight generates molecules such as acetylene and hydrogen gas in the atmosphere that could be used for energy in alien biology. "Microorganisms on the surface of Titan would have these food sources just coming down from the sky, no need to bother with photosynthesis," McKay told Space.com. McKay suggested that many potential limits to life, such as acidity, saltiness or ultraviolet radiation, are unlikely to be extreme enough to stifle life. He said the most important parameter for Earth-like life may be the presence of liquid water, but studies of life in extreme deserts show that even a small amount of rain, fog, snow and even simple humidity can help sustain life. Moreover, alien life may not even need liquid water; the liquid hydrocarbons on Titan, for example, might serve as the basis for life, playing the same role water does for life on Earth. Artistic representation of the potentially habitable world Kapteyn b with the globular cluster Omega Centauri in the background. It is believed that the Omega Centauri is the remaining core of a dwarf galaxy that merged with our own galaxy billions of years ago bringing Kapteyn's star along. Image released June 3, 2014. Still, researchers no longer have to focus on whether life might exist on extreme planets. "In our solar system, the worlds of interest to astrobiology — Mars, Europa, Enceladus and Titan — are small, cold and dry. Really, compared to Earth, they're pretty grim, but they're all we've got," McKay said. "The exoplanets we're seeing now include real Earth-like worlds, where life might not be extreme at all." McKay suggested that if a distant world possesses atmospheric oxygen levels greater than a few percent, there could be complex multicellular life there. He said those searching for oxygen on alien planets might want to focus on the exoplanet Kepler 186f, about 500 light years from Earth in the constellation Cygnus. Kepler 186f is the first Earth-size planet orbiting a star in the "habitable zone" — the range of distance from a star where liquid water might pool on the surface of an orbiting planet. "My number one target right now for an exoplanet that might have life is Kepler 186f," McKay said. "If we found oxygen there, that would be a landmark discovery, and almost certainly a sign of life. That would be really cool." McKay detailed his analysis June 9 in the journal Proceedings of the National Academy of Sciences.